There are a number of specifications and designs to choose from when installing a long jump pit facility for your school, club, leisure centre or other organisation. It is vital to have all the necessary information so you can make the right decision and choose the best specification for the athletes who will be using the facility. Whether your long jump runway will be used by children or adults, for professional training or recreational use, we can help you find the right one to suit your requirements. We can give you some advice on the costs for installing these facilities so don’t hesitate to contact us if you would like more information. Just use the contact box and let us know what you’re looking for so we can give you the best professional help. The most popular material for long jump runways is polymeric surfacing, this is made up of lots of particles of EPDM rubber which are mixed together in a binder to create a hard rubber surface which is laid at a depth of 15mm. This rubber surfacing is hard wearing, durable and requires little maintenance once it has been installed, it is an ideal runway material for professional athletes and older children to practise their long jump skills on. If your long jump facility is going to be used by younger children, for example at a primary school, a better material for your long jump runway would be a Multisport artificial grass athletics track. This is a softer surface which is better at absorbing impact from trips or falls and can be installed in a variety of colours or in a multi coloured rainbow design including red, green, blue and yellow. Sports surfacing contractors can install long jump runways with a single lane, double lane or multi lane depending on your requirements, for example at schools it is often a good idea to have more than one lane so the maximum number of students are taking part at any one time. 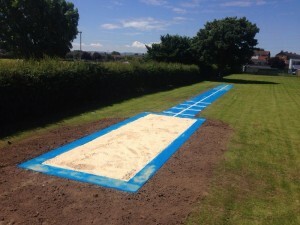 All long jump facilities need a good sand pit to ensure a safe landing once the athlete has completed their jump, a high quality landing pit reduces the risk of injury and also makes sure that results of the jump are taken accurately. A long jump pit can be installed to meet the individual requirements of your project, for example a standard IAAF landing pit is 9m x 2.75m, this would be recommended for more professional long jump runways. If the athletics facility is going to be used for younger children, a smaller 6m x 3m would be better as it’s unlikely a primary school age child would be able to jump further than that. To ensure that your long jump pit is as safe as possible it is advised, especially if the facility is being used by children, that you have sand pit rubber safety edges installed as these can absorb more impact from trips and falls compared to the traditional pre cast concrete (PCC) edges. The costs involved with construction of a long jump runway and landing pit can vary greatly depending on the dimensions and specification of the facility you want, the location of your organisation and the existing conditions of the site. We can also assist you with funding for you long jump surfacing project through funding grants where you can find grants which your organisation may be eligible for. For more information about the costs to construct a long jump runway and landing pit, or to submit an enquiry, please email scott@softsurfaces.co.uk. If you would like any further information about our products and services, visit our website at https://www.sportsandsafetysurfaces.co.uk/ where you can find details of our previous sports surfacing projects. Let us know in the comments if you found this post useful, and don’t forget to share it with your friends!